Californian rocker, Chuck Prophet hits Edinburgh in June this year for a gig The Voodoo Rooms. He was in majestic form in Glasgow at the tail end of last year, driving his way through latest release, Night Surfer. The former Green on Red bandsman has been producing records and performing enticing live shows for 20 years with no dip in quality. Chuck is one exciting performer, all his gigs are moments to savour. 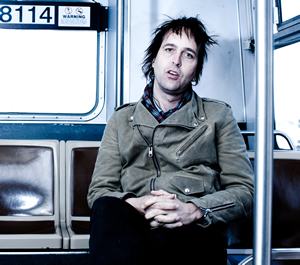 Chuck Prophet returns to Glasgow with the Mission Express in support of his thirteenth album which is scheduled for release early next year on Yep Roc. Every year Chuck’s ups the quality stakes on his albums from the amazing ‘Let Freedom Ring’, to ‘Temple Beautiful’ and his last album ‘Night Surfer’ they have all seen Chuck at the top of his game. Where Chuck excels the most is in the live setting with his two hour powerhouse shows pulling tracks from his massive back catalogue and stretching them out with epic guitar solos on tracks like ‘You Did’ or ‘Castro Halloween’. Since emerging onto the music scene at age 18 as a member of the seminal rock band Green on Red, Prophet has collaborated with everyone from Warren Zevon, Kelly Eillis, Jim Dickinson, Alejandro Escovedo and Lucinda Williams. Prophet’s music has been featured in films as well as the hit tv shows “True Blood”, “Californication” and “Sons of Anarchy” and most recently been covered by the likes of Bruce Springsteen. Chuck Prophet and The Mission Express will bring their raucous, glorious and majestic show to Edinburgh on November 19 this year. His Glasgow gig earlier this year was a terrific example of a crowd- pleasing showman with a top-notch American songbook behind him to deliver big style rock ‘n roll – it was a full-on love in between the frontman/guitarist and a audience who roared their approval throughout. Tracks from his latest release, Bobby Fuller Died For Your Sins, his 13th solo effort since his Green On Red Days, slotted into the set easily and rowdily. There’s a lot of humour around when Chuck hits the stage with his ace band, and he’s one of those performers who clearly and dearly loves what he does. “Chuck never fails to deliver a 100 per cent, good-time-for-all type show, so this Edinburgh gig promises to be another great night for all,” said Kevin Morris of The Fallen Angels Club. Chuck Prophet is always a welcome visitor to Glasgow and so his May show is already eagerly being put in diaries. A big guitarist, Prophet is also a revered writer’s writer with the likes of Lucinda Williams and Alejandro Escovedo among his biggest fans. Escovedo’s last three CDs were co-written with Prophet. His shows are full-on bursts of joy where everyone is guaranteed a good time.